Over the course of seven features, director Paul Thomas Anderson has built up a reputation for himself as arguably the finest filmmaker of his generation. It’s symptomatic of Hollywood’s current priorities, then, that even a director as lauded and widely-esteemed as Anderson has a difficult time getting a film made. After finishing his 2007 masterpiece THERE WILL BE BLOOD, Anderson struggled for several years to get his follow-up, THE MASTER (2012), off the ground. This time away from production allowed him to develop several projects simultaneously, one of which was the first novel from cult crime novelist Thomas Pynchon to ever be adapted to the screen. Titled “Inherent Vice”, the novel’s film rights were promptly snatched up in 2010 by Anderson and his producing partners Daniel Lupi and JoAnne Sellar. Anderson scripted the adaptation himself, with an eye to cast Robert Downey Jr in the central role of Doc Sportello, a stoner burnout turned private investigator. However, the film’s extended development cycle caused the director to reconsider his choice, and in the end, Downey was replaced by the leading man of Anderson’s previous film, Joaquin Phoenix. INHERENT VICE marks Anderson’s return to the studio fold after the independent production and distribution of THE MASTER, but even the increased firepower afforded by Warner Brothers’ backing wasn’t enough to save the film from its own labyrinthine plotting and an ambivalent audience reception. After completing two consecutive portraits of powerful, disciplined men, critics decried Anderson for taking a hard left turn into irreverence and mischief– but in the process, he just may have created a new cult classic that’s far, far ahead of its time. The plot to INHERENT VICE is, in a word, incomprehensible. The story’s various twists and turns are densely layered and delivered almost entirely in stoner mumble and hippie slang. Multiple viewings aren’t encouraged, they’re mandatory in order to fully untangle the sea of knots that Anderson has woven here. It’s important to note then, that this is not a simple case of directorial overindulgence; in presenting INHERENT VICE in this way, Anderson has faithfully captured Pynchon’s idiosyncratic voice and spirit right down to the letter. The story is set in 1970, in the fictional SoCal seaside village known as Gordita Beach (akin to the real-life Hermosa or Manhattan Beach communities). The Manson murders have brought the Free Love era crashing to the ground, shattering the collective dream of the 1960’s and leaving everyone too zoned out to pick up the pieces. Their utopian dreams in shambles, the hippies and the stoners have chosen to carve out their own place within the workforce– one of whom is Doc Sportello (Phoenix) a private investigator who works out of a rented room inside of a doctor’s office. One night, he’s visited upon by his ethereal ex, Shasta (Katherine Waterston), who pleads for his assistance in tracking down her new beau– a real estate mogul named Mickey Wolfmann (Eric Roberts) who has recently gone missing. Doc agrees to help Shasta, partly because he still carries a torch for her. As he descends into the seedy underbelly of SoCal’s surf culture, he manages to uncover a sprawling criminal conspiracy perpetuated by crooked cops, hedonistic dentists, and murderous white supremacists. Frankly, it’s hard to keep track of all the disparate elements, and the only thing that’s given a modicum of bleary-eyed clarity is the film’s title. Even then, it’s full meaning is maddeningly elusive. Going by the film’s definition, “Inherent Vice” is a shipping term that describes an item whose decay is an inevitable product of its own internal components (rather than via external forces). Milk will spoil, chocolate will melt. In the film, Doc wonders what the term means when it’s applied to ex-girlfriends– we can surmise that it is our own inherent vices that turns those girlfriends into exes in the first place. Our weaknesses and indulgence cause us to deteriorate from the inside, keeping us from arriving at our destination in a pristine, perfect state. Anderson’s approach to INHERENT VICE suggests that the film, then, is about the Flower Power generation’s internal degenerative agents and their attempts to keep their particular way of life alive in the face of a New Conservatism embodied by figures like Ronald Reagan. Controversial leading man Joaquin Phoenix fully embodies Thomas Pynchon’s eccentric creation in his second consecutive appearance for Anderson. Much like Anderson’s original choice, Robert Downey Jr, Phoenix is a no-brainer for the role, and could’ve sailed by on the strengths of his own eccentric charisma. However, Phoenix disappears entirely inside Sportello’s signature mutton-chops and birkenstocks. A burned-out hippie in the grand tradition of THE BIG LEBOWSKI (1998), Sportello is a relic of a bygone age that won’t recognize that it has ended. Phoenix charmingly mumbles his way through Anderson’s idiosyncratic caper, but years of heavy drug use have done little to dull his investigative edge. Josh Brolin’s Lt. Christian “Bigfoot” Bjornsen is almost the exact opposite– a sharp-witted lawman with a particularly blunt approach to justice. Brolin is effortlessly convincing as the lantern-jawed, masculine ideal of Eisenhower-era America. The ironclad resoluteness of Lt. Bjornsen is a fantastic foil to Sportello’s squirrelly paranoia, creating a truly entertaining chemistry that fuels the film’s momentum. In the absence of a true, singular villain for Sportello and Bjornsen to track down, the story compensates by focuses instead on the titanic battle of wills between these two characters– each man embodying the ideals of their respective eras and hellbent on staying afloat amidst the tumultuous sea of change that threatens to wash right over them. A rogue’s gallery of oddballs and eccentrics populate Anderson’s supporting cast, most of whom are working with the director for the first time. As Doc’s ex-lover, Shasta, Katherine Waterston is presented to the audience in a manner not unlike a spiritual vision. She’s a ghost– drifting in and out of Doc’s life without warning, bewitching him with her perpetual pout. Already a growing presence within the independent scene, Waterston delivers a breakout performance that lingers in the mind, infecting the audience’s memory much in the same way she’s infected Doc. Better known for her musical career as a singer and harpist, Joanna Newsom lends her ethereal physicality to the film as Sortilege– a character whose purpose within the narrative is never fully explained. She acts as something of an avatar for Pynchon himself, preserving his distinct prose in the form of onscreen narration. It’s implied several times throughout that only Doc has the ability to see and interact with Sortilege, which suggests that she might be something of a guardian angel– a soothing voice to calm the paranoid storm raging in Doc’s head. Despite extremely limited screen time, Benicio Del Toro makes a memorable impression as Sauncho Smilax, an attorney specializing in marine law who acts as a pro-bono lawyer, confidant, and friend to Doc. The same can be said of Owen Wilson in his subdued performance as Coy Harlingen, an ex-junkie musician and family man who’s been faking his death for the last few years. Jena Malone is quickly becoming one of the more interesting character actresses of her generation, as evidenced by her turn in INHERENT VICE as Coy’s wife, Hope– another ex-junkie who found God and a set of false chompers after giving birth to their son. Her recent dental work ends up as a vital clue in Sportello’s investigation, linking her to Martin Short’s demented, coke-hoovering dentist character Dr. Rudy Blatnoyd. Blatnoyd is a member of The Golden Fang, the shadowy crime syndicate that’s seemingly behind this whole mess. Rounding out Anderson’s supporting cast of note is a quartet of well-known character actors, each of whom effortlessly slip into the director’s idiosyncratic vision of LA in the early 70’s. Reese Witherspoon plays Deputy District Attorney Penny Kimball, Doc’s current lover and a strong-willed, independent woman in her own right. Curiously, she’s very much a manifestation of The Establishment, an entity Doc has been battling all his life. This character trait leads to some gloriously off-kilter chemistry between her and Doc, and makes for some of the film’s most memorable moments. Eric Roberts, also known as the The Man Who Will Act In Anything, displays formidable control of his craft in his brief appearance as real estate mogul Michael Wolfmann. The mysterious man at the center of this whole caper, Wolfmann is initially presented in photographic form as a rich and successful businessman. However, when Doc tracks him down at a rehab facility outside of town, Wolfmann is strung out and barely coherent, having been placed under the watchful eye of the feds and doped up beyond all recognition. Michael Williams, a rising talent with high-profile turns in THE WIRE and BOARDWALK EMPIRE, makes an amusing cameo as Tariq Khalil, a former member of the Black Gorilla gang who has just gotten out of prison, only to find his old hood completely bulldozed to make way for one of Wolfmann’s planned suburban communities. Finally,SATURDAY NIGHT LIVE alum Maya Rudolph– Anderson’s real-life partner and the mother of his children– appears briefly as Petunia Leeway, the secretary at Doc’s office. 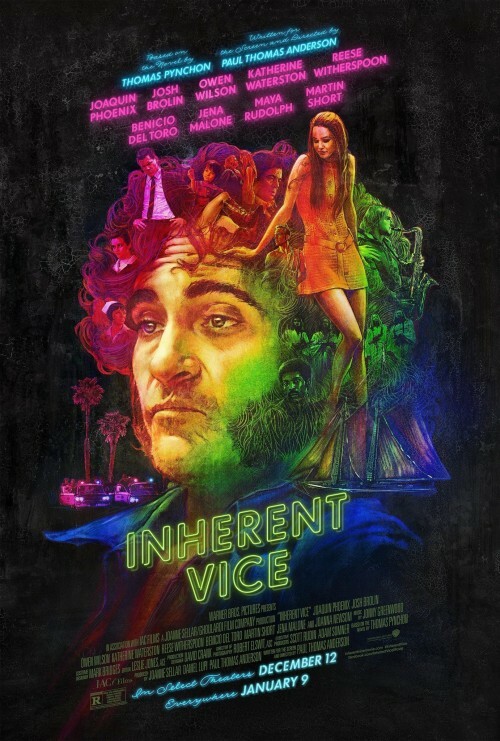 INHERENT VICE is a film that often feels meandering and unfocused– the production process was politely described by Anderson’s collaborators as “chaotic”. Most of the time, this would be a bad thing, but that isn’t necessarily the case here. Indeed, Anderson’s adherence to Pynchon’s particular voice and his cavalier subversion (or outright disposal) of the genre’s most recognizable tropes make for a singularly unique mystery film. The cinematography goes a long way towards conveying this notion, with Anderson’s long-time director of photography Robert Elswit returning to head up the production after his absence during THE MASTER. Having shot most THE MASTER in large-format 65mm film, Anderson and Elswit return to the tried-and-true 35mm gauge, choosing a grainy stock that adds a slight veneer of granola crunchiness. Retaining THE MASTER’s 1.85:1 aspect ratio, INHERENT VICE is presented as a gritty, sunbaked take on the traditional noir genre– some have even go far as to call it a “surf noir”. The color palette deals in muted, faded tones that were once previously bright– a reflection of the harsh sobriety that followed the collapse of the chemically-altered dream of the 1960’s. The lighting is bright and naturalistic, save for the nocturnal sequences, which take on a deep, almost-theatrical cobalt hue. A filmmaker long known for his dynamic camerawork, Anderson’s recent output has seen a noticeable drawdown of flashy techniques in favor of masterful discipline. INHERENT VICE seemingly deviates from this laser-focused approach by shooting a substantial majority of setups handheld, yet it also reinforces Anderson’s previous aesthetic conventions in a big way. The film plays like something of an amalgamation of his prior stylistic epochs: his early-career fondness for extended tracking shots and current fascination with the compositional conceits of portraiture are present in their own right (like in the long Steadicam shot that plays under the opening title), but they’re also combined to form a recurring visual motif unique to INHERENT VICE. Many scenes are presented in extended master shots with little to no coverage, with his compositions accentuated by a slow, almost imperceptible dolly and/or zoom movement forward that’s somewhat reminiscent of Stanley Kubrick’s late-career aesthetic. Anderson’s foray into comedy in the years surrounding PUNCH-DRUNK LOVE (2002) also informs INHERENT VICE, making for his most outright comedic effort in over a decade. There’s a surprising amount of visual slapstick at work here, along with several playful visual gags like a shot of his characters partaking in a pizza dinner party composed to recreate Leonard Da Vinci’s “The Last Supper”. 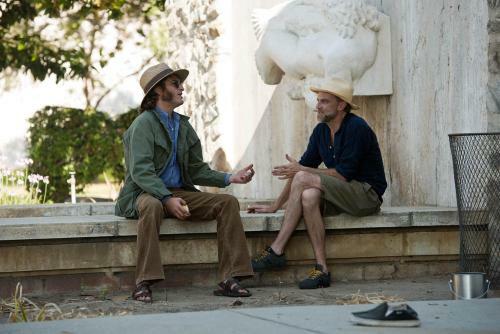 INHERENT VICE marks Anderson’s first collaboration with a new production designer, David Crank. Having worked as an art director under legendary production designer Jack Fisk on Anderson’s previous two features, Crank stepped up to the task when Fisk proved unavailable to reprise his role (most likely due to his commitments on Terrence Malick’s forthcomingKNIGHT OF CUPS). INHERENT VICE takes place in a 1970’s that has yet to see the glittering disco balls depicted inBOOGIE NIGHTS (1997), so naturally the film’s aesthetic hews closer to a late 60’s feel. Crank’s production design is realistic and low-key, projecting a modest and lived-in authenticity that never descends into camp or exaggeration. In his third consecutive collaboration with Anderson, Radiohead guitarist Jonny Greenwood proves himself an invaluable component of the director’s mid-career aesthetic, much like Jon Brion had been for HARD EIGHT (1996) through PUNCH-DRUNK LOVE. Greenwood is inherently suited towards Anderson’s artistic quirks, enabling him to complement and elevate the footage into a higher, sometimes-transcendent realm. For all its perceived imperfections, INHERENT VICE’s strongest suit is arguably Greenwood’s original score– a romantic, mysterious and avant-garde effort comprised of violins, oboes, and musical saws that harken back to the ornately orchestral cues of yesteryear. While he doesn’t lean on needledrop source tracks as much as he did in the first act of his career, Anderson nevertheless uses his lively period setting as an opportunity to employ some choice art-rock and pop classics from the era. The most high-profile of these tracks is Can’s “Vitamin C”, deployed as a luridly beckoning narrative agent during the film’s opening sequences. Artists like Neil Young and Sam Cooke also appear on a soundtrack that ably captures the eclectic vibe of vintage SoCal: a broadly diverse palette of crooning country ballads, funky R&B cuts, and psychedelic rock riffs. The music technically may be from the same era, but it’s a far cry from the bright, cheery pop tunes we heard in BOOGIE NIGHTS. Indeed, INHERENT VICE’s selection of cues highlights the darker, more-paranoid aspects of the decade. Throughout the film, Anderson recurringly utilizes an interesting musical technique that blurs the line between in-scene music (diagetic) and soundtrack (non-diagetic). Oftentimes, someone will be listening to music within a scene only for Anderson to then transition to the next beat while changing the acoustic dynamics of the track to reflect that it’s now playing over the image. The effect is similar to stream of consciousness– a cascading flow of ocean waves washing over us and carrying us through into the next moment. Though INHERENT VICE may be a faithful adaption of Thomas Pynchon’s novel, there’s so much overlap between the source material and PTA’s core thematic conceits that the final product also reads as decidedly Anderson-ian. His recent explorations into the dynamics of power with THERE WILL BE BLOOD and THE MASTER is manifest in INHERENT VICEvia the ideological war being fought by Doc and Lt. Bjornsen. They have diametrically-opposed outlooks on life, but they’re flip sides of the same coin: they’re both inclined to seek out the truth. As such, their animosity and one-upmanship ironically resembles mismatched buddy cop comedies or the withering pettiness of sibling rivalries. The off-kilter intimacies of non-blood familial relationships drive Anderson’s characters throughout his filmography, with INHERENT VICE’s contribution being the major subplot that endeavors to reunite Coy Harlingen with his wife and child. Funnily enough, this subplot ultimately serves as the source of the film’s climactic emotional catharsis in the absence of a tidy resolution to the film’s primary plot. Bizarre, dysfunctional sexual encounters are another prominent component of Anderson’s artistic aesthetic, a conceit that plays out in INHERENT VICE via a visit to a secret “massage” parlor, pornographic neckties, and a love scene between Doc and Shasta that plays out with such a prolonged sense of suspense and anticipation that it would make Sergio Leone jealous. Perhaps the most significant aspect of INHERENT VICE as it pertains to its place within Anderson’s larger body of work is its engagement with California’s distinct cultural heritage. Much like THE MASTER explored how the Golden State’s relaxed sense of independence made it a breeding ground for crackpot religious cults and delusional charlatans, INHERENT VICE examines how the potent cocktail of mind-altering substances and alternative lifestyle explorations in the 1960’s exploded into countless subcultures and communities. Indeed, more so than many other films to my memory, INHERENT VICE captures that peculiar blend of paranoia and unease that plagued LA’s utopian communities in the wake of the Manson killings. The sunny LA cityscape has always been a colorful place, culturally-speaking, and INHERENT VICE bypasses the glitz of Hollywood or the glamor of Beverly Hills in favor of the Southland’s drought-choked sprawl. Distinctly Californian characters like hippies, neo-Nazis and cult leaders clash together in distinctly Californian locales like seaside coffee shops, rehabilitation facilities and canyon-side mansions. As his filmography has grown, it’s becoming more evident that Anderson has achieved something remarkable– with the exception of HARD EIGHT, the Golden State has served as a prominent connective tissue between all of his films. Just as much as the 20th Century could be called “The American Century”, so too could it reasonably be referred to as the “The Californian Century” in that the state was an embodiment of the progressive ideals that drove American prosperity for much of last century. Anderson’s films mostly take place in California, spanning a wide variety of time periods. The span is so wide, in fact, that nearly every decade of the 20th Century (save for the 30’s) is represented at some point in Anderson’s work. THERE WILL BE BLOOD covered the birth and growth of the state from the turn of the century to the late 20’s. The postwar boom times of the 40’s and 50’s are the setting of THE MASTER. INHERENT VICE takes place in 1970 but contains flashbacks to the 60’s. BOOGIE NIGHTS’ decadent excess spans both the 1970’s and the 80’s. MAGNOLIA andPUNCH-DRUNK LOVE explore California’s evolving sense of identity during the 90’s and the turn of the new millennium. If you were to watch Anderson’s output in chronological order according to their story’s time periods, you’d come away with a weirdly alternate, yet comprehensive history of the American Century as seen through California’s distinct perspective. INHERENT VICE is the kind of film that’s not easy to love– it takes multiple viewings to even understand its plot, let alone embrace the idiosyncratic quirks of Anderson’s vision. When it premiered at the New York Film Festival to polarized reviews, word of mouth began to spread that Anderson had made an objectively bad film. Critics praised the performances of his cast, but they all pretty much agreed that the story was unsalvageable– an overindulgent failure. Box office receipts were consistent with this reaction, confirming INHERENT VICE’s cultural reputation as a huge misfire from one of our most treasured filmmakers. Any Oscar campaign plans were probably scaled back instantly, but even the mountain of disappointment that greeted the film upon its release couldn’t stop it from earning Oscar nominations for Best Adapted Screenplay and Best Costume Design. The collective frustration with the film is very real, most likely a reaction stemming from only one or two viewings at best– relatively snap judgments made by people who don’t care to commit to untangling the film’s myriad mysteries. Like so many films before it, INHERENT VICE might simply be a victim of unrealistic expectations– after all, Anderson’s previous two works were staggeringly confident and majestically executed, and if the director’s rabid fanbase was expecting more of the same, they were bound to be sorely disappointed. Such expectations tend to deny filmmakers like Anderson their right as artists to grow and experiment, and anyone who expects their favorite artist to deliver the same thing again and again like its some mechanized process surely misses the entire point of art. Of course, INHERENT VICE could also simply just be a bad film– it ultimately comes down to individual taste. Just like the unattainable mystery at the center of the film, there will probably never be a definitive critical consensus as to INHERENT VICE’s place in the cinematic landscape. If I was a betting man, I’d wager that it’ll slowly accumulate a cult appreciation not unlike THE BIG LEBOWSKI as multiple viewings increasingly reveal the full scope of Anderson’s irreverent vision. What’s less ambiguous about INHERENT VICE is its place within Anderson’s body of work. As of this writing, Anderson is forty-five years old and has seven features to his credit. It’s hard to imagine that the hotshot kid who made BOOGIE NIGHTS is nearly fifty now. By middle age, most successful directors have found an aesthetic that maximizes their personal strengths, inevitably settling into a long period of what one could call beneficial stagnance– yet it’s stagnance nonetheless. Treading water keeps you afloat, but it doesn’t actually take you anywhere. Midway through his career, Anderson seems to have found his strongest suit only to throw it away in hopes he might stumble across an even stronger one. He’s experimenting; pushing the boundaries of his voice. The results may be uneven, but they keep his perspective fresh and honest. The irreverent playfulness on display in INHERENT VICE marks a departure from his string of John Huston-inspired power portraits, and while it’s a safe bet that Anderson won’t bring this film’s stylistic approach to his next, he most definitely will continue to refine and rework what it means to be “A Paul Thomas Anderson Film”. INHERENT VICE is currently available on high definition Blu Ray via Warner Brothers.